Go back to the main Instrument Flight Rules Page. Attitude instrument flying is defined as the control of an aircraft’s spatial position by using instruments rather than outside visual references. Today’s aircraft come equipped with analog and/or digital instruments. Section II acquaints the pilot with the use of digital instruments known as an electronic flight display (EFD). The improvements in avionics coupled with the introduction of EFDs to general aviation aircraft offer today’s pilot an unprecedented array of accurate instrumentation to use in the support of instrument flying. If you are studying for or planning on studying for your instrument rating, the ASA Test Prep guide for the Instrument Rating will help you prepare with samples of every test question in the FAA exam database, along with their answers and explanations. Subjects covered are: meteorology, flight and navigational instruments, instrument flight rules and procedures, arrivals and approaches, and review computations. It also includes a computer testing supplement. 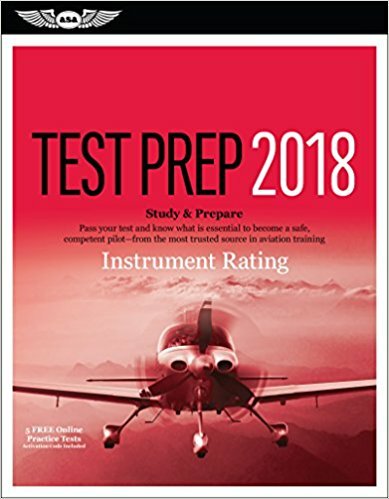 You should also consider getting a copy of the Instrument Pilot Oral Exam Guide by Michael D. Hayes to prepare for the oral exam as well as the the Instrument Rating Airmen Certification Standards by the FAA which outlines the standards for passing the knowledge and oral exams.